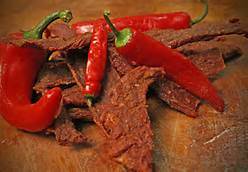 The Beef Jerky Outlet specializes in all kinds of beef jerky from original to fiery hot, with over 200 varieties in all. The store offers free samples for those who like to try a wide variety of flavors before purchasing. But beware, my husband was at the peppers shop and put a free sample in his mouth before reading the sign. It was too hot for him. He was sweating and really having a hard time with it. The world’s largest selection of beef, turkey and wild game jerky are available at Beef Jerky Outlets. Bulk jerky can be found in covered barrels and is sold by the pound, while packs of pre-sealed jerky and pound jerky jars can be found on the shelves. The Beef Jerky Outlet offers a unique selection of jerky, sausage and snack foods. 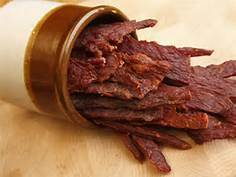 There are 200 or more different kinds of jerky, including exotics like alligator and kangaroo. They have some other items, too like sausages, popcorns and peanut butters for example. The Beef Jerky Outlet sells USDA Beef Jerky that can’t be bought at markets or convenience stores. All of their suppliers use whole muscle beef which is raised in the United States. Sevierville, Tenn. – Sevierville’s Bloomin’ Barbeque & Bluegrass (May 16 & 17, 2014) festival has announced the entertainment lineup for its tenth annual event, including a headline performance from rising bluegrass supergroup, The SteelDrivers. Festivities and music get underway in downtown Sevierville, Tennessee on Friday, May 16 at 5p.m. with a live performance from Grammy winning and national fingerpicking champion, Bill Mize. The Jeanette Williams Band and Jimbo Whaley & Greenbrier will follow Mize before Russell Moore & IIIrd Tyme Out close out Friday night’s show. This past weekend my husband and I had a little getaway. We left our daughter in the care of her grandparents and spent Saturday and Sunday in Pigeon Forge, TN. We’ve both been there numerous times in our lives and as such we usually end up feeling like we’ve already done it all and seen it all. 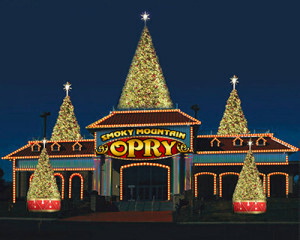 So as we were wracking our brains for something Christmas themed to do, we passed a billboard advertising the Smoky Mountain Opry Christmas show. We felt pretty confident that the show would already be sold out, but just to be certain I called the ticket office and to our surprise they had two seats available for us. So we purchased them on a hope and a prayer that it would actually be entertaining and worth the money. Visitors can enjoy the complete line of Dillsboro Chocolate Factory’s award winning chocolates and smooth creamy fudge. The Chocolate Factory makes some of the finest chocolate treats around using only gourmet single bean Venezuelan cocoa for all of its tasty treats. Specialties include Smoky Mountain Truffles and Shooters, along with a wide assortment of dipped and molded chocolates available in milk, dark and white chocolate. The Smoky Mountain Truffles are all named for iconic places in the Smokies like Chimney Tops, Cades Cove, Cold Mountain and Black Rock. Each flavor of truffle has a unique recipe. Chimney Tops is a chai tea truffle flavored with nutmeg, cinnamon, black tea and cloves. This truffle earned first place in the 2009 Taste of Chocolate show in Waynesville, NC. There are over a dozen original Smoky Mountain Truffle flavors available. Shooters are the newest line of fine chocolates created by the Dillsboro Chocolate Factory. Shooters take the award winning Ganache (chocolate cream filling) recipe used in making the truffles and adds a touch of spirits to create interesting new flavors. Fire Jack shooters are made with milk chocolate Ganache infused with cinnamon and Jack Daniels. Apple Martini shooters are made with white chocolate Ganache infused with Apple Pucker and apple cider. The Chocolate Factory’s Wild Turkey shooter earned first place honors in the Professional Division at the 2012 Taste of Chocolate held in Maggie Valley, NC. Wild Turkey shooters start with creamy milk chocolate Ganache infused with caramel, fine crushed pecans and of course real Wild Turkey 101. As a final touch, the Wild Turkey shooter is topped with the Dillsboro Chocolate Factory’s own butter toffee. While the truffles and shooters are delicious, the heart of the Dillsboro Chocolate Factory is the handmade chocolates and fudge. There are dozens of flavors of handmade chocolate and fudge treats. For more adventurous chocolate lovers there is a specialty line of savory chocolates each made with spices. These include hot spicy Aztec bars, Cajun chocolate and a unique ginger chocolate. Every now and then the Chocolate Factory offers Caribbean Jerk chocolate as well as whole peppercorn chocolate bars. For fudge lovers there are more than a dozen flavors made each week in Dillsboro and brought over to Pigeon Forge as well as the Beef Jerky Outlet stores in the area. Summer fun flavors include watermelon and key lime pie which is made with real Key Lime juice from Key Largo, Florida with an original recipe graham cracker crust . Of course there is always good old plain chocolate fudge as well. The Pigeon Forge location will be closing at the beginning of August 2014.